Kyle Larson’s got a slightly new look for his No. 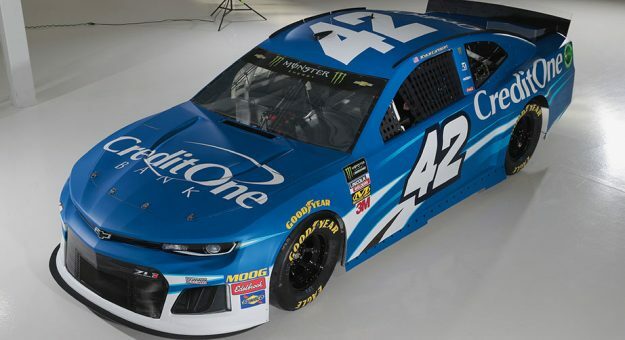 42 Credit One Bank Chevrolet for the 2019 Monster Energy NASCAR Cup Series season. The Chip Ganassi Racing driver’s car will sport a little more blue on the hood and in front of the grille. Another subtle difference is a white streak on the side of the car leading to the number. The splitter is also white instead of blue as it was in 2018. 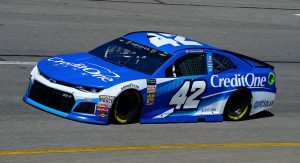 RELATED: How did Larson fare in his Credit One Bank scheme in 2018? Credit One is in the midst of a multi-year association with Larson and CGR. The company sponsored 17 races of Larson’s in 2018. The 26-year-old is entering his sixth season in the sport’s top series. The 2018 campaign saw Larson make the NASCAR Playoffs for the third straight year and finish ninth in the standings. He tallied 12 top fives, 19 top 10s and three poles on the year.